A hot topic for cycling in the borough is Richmond Park and how those on bicycles can contribute to the park. RCC will campaign for the below since we believe it will improve the park for all vulnerable users. Recognise park users should have priority as follows. Pedestrians, horse riders, cyclists, motor vehicles. Encourage all to respect wildlife. 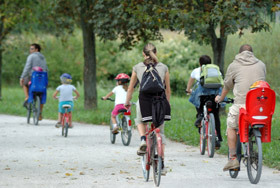 Promote and encourage responsible cycling, whether as a mode of transport or for leisure. Campaign for the reduction of through motor traffic with the aim of creating safer and more comfortable conditions for pedestrians and bicycles. Campaign for pedestrian and cyclist priority at all points where the Tamsin trail crosses roads. Campaign for more dedicated space for cycling across borough roads, recognising that this will reduce pressure on the Park’s resources. The sad truth is that the majority of weekend (most noticeably) cyclists have little or no road sense and are rude and obstructive to other road users and pedestrians alike – try crossing the road when one of their “pelotons” 4 or 5 abreast come hurtling down the road well in excess of the speed limits. The park is NOT a race track and should not be treated as one. As for reducing motor traffic the park is shared space and many locals who contribute to its upkeep walk their dogs and enjoy the open spaces – why should they be discriminated against? Let’s have more police control over their selfish and abusive use of the park. – just spending money on signage would not help.